Skin of colour represents the non-Caucasian darker shades of skin ranging from black, brown, olive, and tan. It comprises the skin of ethnic descent typically spanning the Asian, African, Mediterranean, Middle-Eastern, Hispanic and Native American racial backgrounds. There are a number of classifications based on genetic disposition, reaction to sun exposure and cosmetic interventions, and the tanning properties of the skin, these include Fitzpatrick, Robert’s, Obagi, Kawada, and Glogau. Lately, a new genetico-racial skin classification has been introduced by Fanous et al., which highlights the importance of incorporating the genetic and racial origin of the patient during assessment. The ‘north-to-south’ phenomenon that depicts the change in skin colour and features across the globe forms the base for this classification. The important variables that have been taken into account are the colour of the skin, thickness of the skin, and facial characteristics. Accordingly, six genetico-racial subtypes are described from the three founding races1. What is responsible for skin colour? Colour in humans is determined by a group of complex pigments called melanin, which is responsible for the colour imparted to skin hair and eyes. Melanin comes from the ancient Greek melanos, meaning ‘dark,’ and, according to Borovansky, the term was probably first applied by the Swedish chemist Berzelius in 1840 to call a dark pigment extracted from eye membranes2. The first relatively detailed written description on skin pigmentation in mankind came from Herodotus in Greece, who described the darker skin of Persians, Ethiopians, and Indians in relation to Greeks3. Chemically, melanins may be classified broadly into eumelanin (eu = good) and pheomelanin (pheo = cloudy or dusky). 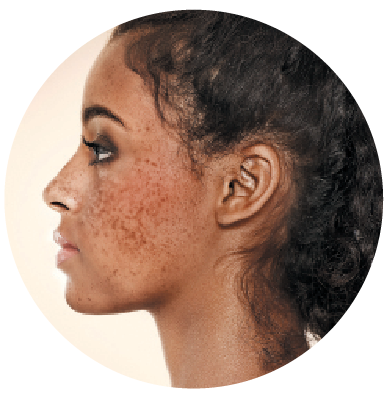 Eumelanin is prevalent in individuals with black and brown hair and pheomelanin is responsible for red hair and freckles. Studies have shown that darker skin has higher total melanin and eumelanin content, and a higher ratio of eumelanin to pheomelanin than those derived from lighter skin4. Melanin in animals is produced in melanocytes, which are specialized cells found in the basal layer between the dermis and epidermis. Typically, human skin has between 1000 and 2000 melanocytes per mm2, which comprise around 2–3% of the total number of epidermal cells5. Although all races of human beings possess a similar concentration of melanocytes in their skin, melanocytes in different ethnic groups and among some individuals differ in the level of gene expression related to melanin production, thereby conferring less or greater levels of melanin in the skin and hair, and in the relative amounts of eumelanin and pheomelanin produced. This process is under hormonal control, mostly alpha-melanocyte stimulating hormone (α-MSH )6. Melanocytes synthesize melanin in a special organelle called melanosome and move along arm-like structures named dendrites of the melanocyte to be transferred to epidermal keratinocytes. In humans, each melanocyte transfers melanosomes to around 30 surrounding keratinocytes, forming the melano-epidermic unit2. Tyrosine is the common precursor for both eumelanin and pheomelanin production. 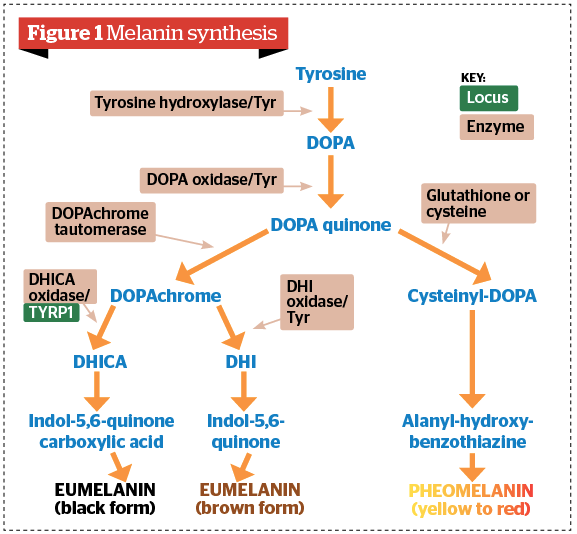 The synthesis of melanin takes place inside melanosomes, following transfer of the enzyme tyrosinase, which oxidizes tyrosine to dihydroxyphenylalanine (DOPA) and dopaquinone (DQ). Large bioaggregates composed of homo or hetero-units of pheo and eumelanin compounds are formed by oxidation and cyclization of the initial substrate, tyrosine7. Human skin contains a mixture of melanin types, the ratio which, in part, determines visible pigmentation. The diversity of skin pigmentation among different ethnic groups is preserved and depends on eumelanin content. The ratio of eumelanin to total melanin is what decides skin colour. Pheomelanin does not correlate with skin pigmentation as a similar amount of this pigment is observed in dark as well as light skin8. Skin pigmentation is due to the accumulation of melanin granules in keratinocytes, which act as a natural sunscreen that potently absorbs UVR, thereby blocking its ability to penetrate into the deeper skin layers where proliferating cells reside9. Being the most potent blocker of ultraviolet radiation (UVR), the role of melanin in photo-protection is complex. This is because one type of melanin, called eumelanin, is UV absorbent with a higher resistance to degradation and has the ability to neutralize reactive oxygen species; whereas the other, pheomelanin, is photo-unstable10. Skin hyperpigmentation may be caused by stress or exposure to sunlight, which stimulates the release of α-melanocyte stimulating hormone (α-MSH) from damaged keratinocytes. The receptor (MC1R) acts as a signaling molecule on melanocytes that responds to α-MSH by inducing an expression of enzymes responsible for eumelanin (brown/black melanin) synthesis10. Some of the conditions encountered in clinical practice have been discussed briefly below. Melasma is an acquired symmetric hypermelanosis most commonly visible over the face. 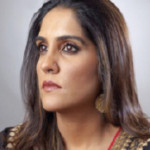 Melas ma is seen in constitutionally darker skin (Fitzpatrick skin types 3 and 4) being most common in people with light brown skins who live in areas with intense solar ultraviolet radiation (UVR). It generally starts between the age of 20 and 40 years and at least 90% of those affected are women12. 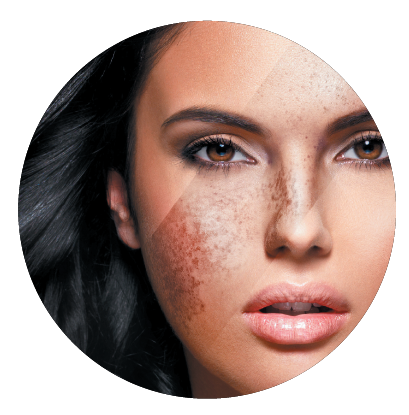 Melasma is known to have a multifactorial aetiology. Contributing factors include increased UV exposure, pregnancy, cosmetics, genetic factors, endocrine factors, and hormonal therapy13. It is characterized by development of slowly enlarging tan-brown macules and patches. The most common sites of involvement over the face are the cheeks, forehead, upper lip, nose and chin (sun-exposed areas)14. Mandibular: pigmentation on ramus of the mandible. Persistent type: which persists for more than a year after withdrawal of hormonal stimulus and is maintained by UVR and other factors. Indeterminate: in which it is difficult to classify melasma, even with Wood’s light15. It is a cutaneous disorder characterized by blue-black pigmentation mainly on the photo-exposed areas. It occurs when foreign substances cause homogentisic acid to be deposited in the dermis, causing macular and papular hyperpigmentation. It commonly results from the use of topical hydroquinones but has also been associated with the use of phenol, quinine injection, resorcinol, picric acid, mercury, and oral antimalarials16. It presents as asymptomatic bilaterally symmetrical speckled blue-black macules and several grey-brown macules, typically affecting the malar areas, temples, lower cheeks, and neck16. Riehl’s melanosis also referred to as pigmented contact dermatitis, is characterized by a brown-grey colour over sites of application of contactants, especially cosmetics17. Occurs secondary to dermal melanin deposits that manifest due to allergens present in cosmetics and textiles. Cosmetic allergens include red and yellow pigments, chromium hydroxide, aniline and azo dyes, bactericidal agents (carbanilide, ricinoleic acids), hair dyes, red kumkum15, and fragrances. Textile allergens include optical whiteners, dyes, textile finishes, mercury compounds, formaldehyde, and rubber components18. Sites of involvement and pigmentation depend on the allergen responsible — lesions due to cosmetics begin on forehead and temples spreading to involve the rest of the face, even the chest, neck, scalp, hands, and forearms, and can be brown or brown-grey, while those due to textiles more often involve the anterior aspect of the thighs and axillae with red and blue hues19. Is a condition characterized by persistent and asymptomatic slaty-grey pigmentation, predominantly on the face. Lichen planus pigmentosus (LPP) is a disease of the middle-aged, with onset in the third to fourth decades of life with female preponderance. It is a variant of lichen planus that favours skin phototypes III–V and has been known to occur more in tropical areas. Incriminating agents include cosmetics, such as fragrances, hair dyes, mustard oil, and amla oil20. LPP manifests as pigmentation of insidious onset without any features of inflammation or preceding raised lesions. It presents as oval or irregularly shaped slaty-grey to brownish-black pigmented macules and patches in sun-exposed areas, including the forehead, temples, and neck, or intertriginous areas. It is typically asymptomatic, although, occasionally can have mild pruritus. The course is variable with some cases showing spontaneous resolution within weeks to months. It may also be persistent over the years in many21. Periorbital hyperpigmentation (POH) is characterized by light- to dark-coloured, brownish-black pigmentation surrounding the eyelids. It is a commonly encountered condition and also referred to as idiopathic cutaneous hyperchromia of the orbital region (ICHOR), periorbital melanosis, dark circles or infraorbital pigmentation22. It is known to have primary or secondary aetiology. The cause of secondary periorbital hyperpigmentation often has a multifactorial pathogenesis, including genetic or constitutional pigmentation, dermal melanocytosis, post‑inflammatory hyperpigmentation secondary to atopic dermatitis, allergic contact dermatitis, periorbital oedema, and excessive subcutaneous vascularity and shadowing due to skin laxity associated with ageing. Excessive sun exposure, drugs, hormonal causes, and an extension of pigmentary demarcation lines have also been considered to be contributory23. It is an ill-defined entity that presents as bilateral round or semicircular homogenous brown or dark brown pigmented macules in the periocular region24. It is a dermal nevus characterized by bluish pigmentation in the distribution of the first and the second division of the trigeminal nerve25. It occurs predominantly in more darkly pigmented individuals, especially in Asian and African-American people. The lesions occur during infancy, with the majority presenting at birth, and also around puberty26. It is characterized by a blue-grey conﬂuence of individual macules varying from pinhead-sized to several millimetres in diameter. The most common sites of involvement are the periorbital area, temple, forehead, malar area, earlobe, pre- and retroauricular regions, nose and conjunctivae with involvement of the ipsilateral sclera being a typical feature26. A condition where benign epithelial tumours develop on the skin. They are more commonly seen in darker-skinned persons, including those of African descent, Hispanics, and Asians. They have a familial tendency and become more frequent with advancing age27. Multiple, small, 1–5 mm diameter, smooth, firm, black or dark brown papules on cheeks, forehead, neck, upper back, and chest28. It is a dermatosis characterized by thickened, hyperpigmented plaques, typically on the intertriginous surfaces and neck. It is commonly associated with insulin resistance and obesity and, hence, early diagnosis of conditions, such as type 2 diabetes, the metabolic syndrome, and polycystic ovary syndrome is important. It is much more common in people with darker skin pigmentation especially Latinos and African Americans29. It is characterized by dark, coarse and thickened skin with a velvety texture, being symmetrically distributed on the neck, the axillae, antecubital and popliteal fossae, and groin fold30. Also known as Ashy dermatosis, it is a disorder of pigmentation, characterized by asymptomatic symmetric ashy grey-coloured macules. It usually presents during the second to third decade of life and appears to be more common in areas of Latin America and Asia. There is no genetic predisposition, and it affects both genders equally. Ingestion of ammonium nitrate, ethambutol, radio-contrast media or chlorothalonil, nematode infestation, and occupational allergy to cobalt have been implicated invariably but its aetiology remains obscure31. It presents as slate-grey to blue-brown oval, circular or irregularly shaped macules and patches that gradually develop into a symmetric distribution. Lesions typically involve the trunk with spread to the neck, upper extremities, and the face32. It is a skin condition characterized by erythematous and brownish patches seen mainly on the sides of the neck and peripheral face. The condition is most common in fair-skinned individuals in the fourth to seventh decade. There is a female predominance. Predisposing factors include exposure to solar radiation, photosensitizing chemicals in cosmetics and perfumes, hormonal changes related to menopause or a low oestrogen state, and genetic susceptibility33. It presents with a combination of linear telangiectasia, erythema, mottled hyperpigmentation, and superficial atrophy in a reticular pattern, symmetrically affecting the sun-exposed areas, such as the sides of the neck, lateral cheeks, and upper chest. The shaded area under the chin is characteristically spared34. 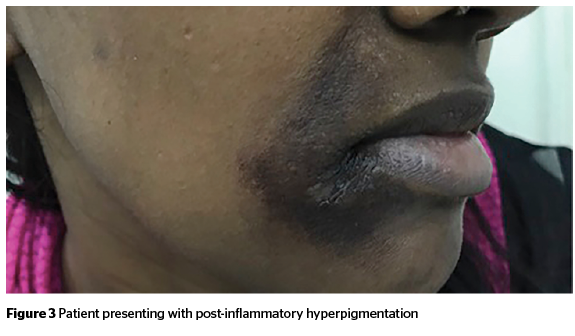 Post-inflammatory hyperpigmentation (PIH) is an acquired hypermelanosis occurring after cutaneous inflammation or injury that can arise in all skin types, but more frequently affects skin-of-colour. A wide range of aetiologies for PIH exists, including infections, such as dermatophytoses or viral exanthems; allergic reactions, such as those from insect bites or a contact dermatitis; papulosquamous diseases like psoriasis or lichen planus; medication-induced PIH from hypersensitivity reactions; or cutaneous injury from irritants, burns, or cosmetic procedures. The hyperpigmentation results from the melanocytes’ response to the cutaneous insult, which causes an increased production and/or redistribution of melanin35. PIH typically manifests as macules or patches in the same distribution as the initial inflammatory process. The time required for the dyspigmentation to normalize is highly variable and relates to many factors, including the patient’s baseline skin tone, the type and intensity of the injury or inﬂammation, and the patient’s sun-exposure habits36. Drug-induced pigmentation represents 10 to 20% of all cases of acquired hyperpigmentation. The pathogenesis of drug-induced pigmentation is variable according to the causative medication and can involve an accumulation of melanin, sometimes following a non-specific cutaneous inflammation and often made worse by sun exposure, an accumulation of the triggering drug itself, a synthesis of special pigments under the direct influence of the drug or deposits of iron following damage to the dermal vessels37. Increasing use of cosmetics has contributed to a rise in the incidence of allergic contact dermatitis (ACD). It is estimated that 1–5.4% of the population is sensitized to a cosmetic ingredient. Patch testing helps to confirm the presence of an allergy and to identify the actual allergens, which are chemical mixtures of various ingredients38. Wood’s lamp can be used to determine the depth of melanin in the skin. The variations in epidermal pigmentation become more apparent under Wood’s light, such as in brown hypermelanosis or epidermal melasma. For dermal pigmentation, this contrast is less pronounced, as with dermal melasma. Dermoscopy is an in vivo method for the diagnosis of pigmented lesions of the skin. Light is either reflected, dispersed, or absorbed by the stratum corneum because of its refraction index and its optical density, which is different from air. Thus, deeper underlying structures cannot be adequately visualized. However, when various immersion liquids are used, they render the skin surface translucent and reduce the reflection, so that underlying structures are readily visible. The application of a glass plate flattens the skin surface and provides an even surface. Optical magnification is used for examination. Taken together, these optical means allow the visualization of certain epidermal, dermo-epidermal, and dermal structures39,40. Antera 3D® relies on multidirectional illumination obtained by LEDs of different wavelengths from different directions followed by a computer-aided reconstruction of the skin surface and using the differences between these images to reconstruct the surface in three dimensions. The skin topography and the chromophores’ concentration are derived from the spatial and spectral analysis of the acquired image data. The acquired spectral data is used to map the distribution and concentration of melanin and haemoglobin (Figure 4). Unlike traditional imaging techniques, where only three colour channels (red, green, and blue) are used, the Antera 3D® uses reflectance mapping of seven different light wavelengths spanning the entire visible spectrum. This allows for a much more precise analysis of the skin colourimetric properties, which are mostly determined by two dominant chromophores: melanin and haemoglobin. The qualitative evaluation of various aesthetic dermatologic conditions using this technique appears promising. The principle behind this instrument lies in the fact that it is analogous to the way our eye perceives colour. It uses white light to illuminate the skin and then measures the intensity of the reflected light through three filters of particular wavelength or photodiode arrays42. The most commonly used tristimulus colourimeter instrument is the chroma meter. The Chroma Meter® CR-400 (Konica Minolta, Tokyo, Japan) device measures the intensity of reflected light and the colour of the skin surface through filters of 450, 560, and 600 nm wavelengths. The skin surface is illuminated with polychromatic light (pulsed xenon arc lamp) and the signal from the skin is reflected into the device and separated into its spectral components using the L*a*b* system of the Commission Internationale de l’Eclairage (CIELab). Briefly, the components are L* for luminance/brightness, the higher the value, the higher the intensity; a* for red/green components of light, positive values representing the red component and negative values representing the green component; and b* for yellow/blue components of light, positive values representing the yellow component of the light and negative values representing the blue component43. They consist of light-emitting diodes to illuminate the skin surface and the intensity of reflected light is recorded using a photodetector. Mexameter M X16 (Courage Khazaka). The benefit of these instruments is that they can distinguish between two main pigments of the skin, such as melanin and haemoglobin, using their distinct spectral curves44. 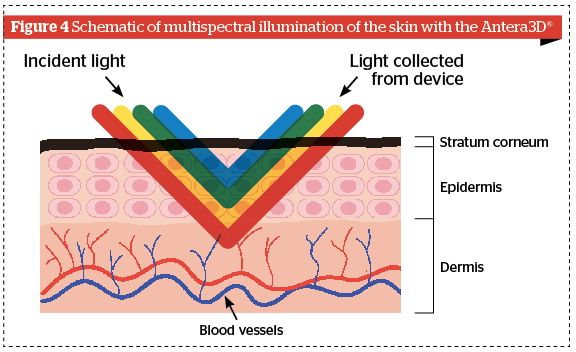 DermaSpectrometer uses two light emitting diodes, green (568 nm) and red (655 nm) to illuminate the skin and the amount of the reflected light is measured using a photodetector. Mexameter uses 16 light-emitting diodes that emit light at three wavelengths — green (568 nm), red (660 nm), and infrared (880 nm). Results are expressed in terms of ‘melanin index (MI)’, a quantitative measurement of melanin, and ‘erythrema index (E)’, a quantitative measurement of skin redness45. Facial hyperpigmentation causes a lot of cosmetic concern in patients with a tremendous emotional impact. Treatment is essentially focused on removal of provoking factors, photoprotection, and some form of active pigment reduction either with topical agents or physical modes of treatment. There is no universally effective specific therapy and existing agents possess varying degrees of efficacy with relapses being frequent. Peak hours of sunlight between 11 am and 4 pm should be avoided in addition to seeking shade and wearing protective clothing (e.g. broad-brimmed hats and long-sleeved shirts). Avoiding provoking triggers and discontinuing drugs that may likely trigger pigmentation is necessary. Broad-spectrum UVA and UVB protective sunscreen with an SPF of at least 30 including a physical block (e.g. titanium dioxide or zinc oxide) should be used for prevention of facial hyperpigmentation. Individuals with darker skin tones who tan easily and rarely burn may feel they do not need to use sunscreen. However, like sunburn, a tan is the result of DNA damage from exposure to the sun’s harmful UV radiation. Darker-skinned people may also be wary of using physical sunscreens, especially titanium-based products because they can look chalky and white on the skin. Newer preparations, however, tend to be micronized, which means the particles are small enough to allow them to blend in and disappear into the skin. 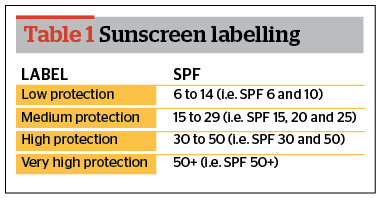 Chemical sunscreens are also an option; look for a broad-spectrum sunscreen with an SPF of 15+46. Sunscreens containing zinc oxide, 10% and SPF of 30 have dual benefit of camouflaging hyperpigmentation over the face and preventing photo-induced darkening36. It is an hydroxyphenolic chemical that has been the gold standard for treatment of hyperpigmentation for many years. The efficacy of hydroquinone (HQ) in facial melanoses (FM) depends on several factors. Epidermal pigmentation responds better than dermal. Higher concentrations give better results (4% being more effective than 2%) as their onset of action is earlier than those with lower concentrations. Antioxidants, such as vitamin C and retinoids, as well as alpha-hydroxy acids, may be used as additives to increase penetration and enhance efficacy47. Adverse reactions to hydroquinone are dose and duration dependent. Reactions include asymptomatic transient erythema, irritation, confetti-like depigmentation with higher concentrations and exogenous ochronosis48. Azelaic acid is a naturally occurring non-phenolic, saturated, nine-carbon dicarboxylic acid. It has anti-inflammatory, antibacterial, and antikeratinizing effects, which make it useful in a variety of dermatologic conditions. Topical azelaic acid has no depigmentation effect on normally pigmented skin, freckles, senile lentigines, and nevi. This specificity may be attributed to its selective effects on abnormal melanocytes. It also reduces production of free radicals. It is available in 10% and 20% concentrations. To hasten and improve response, azelaic acid has been combined with 0.05% retinoic acid (RA) or 15−20% glycolic acid (GA)49. Azelaic acid is well tolerated with the most commonly reported side-effects including pruritus, mild erythema, scaling, and burning50. It acts by chelating the free portion (copper) of tyrosinase. This is brought about by reducing o-phenones to diphenols. In addition, it has antioxidant and photoprotective properties. It is stable and used in concentrations of 1–4%51. It is generally preferred as a second line therapy due to its good safety profile and stability especially when other therapies are not tolerated. It can be used along with other topical medications as well as peels. Adverse effects include contact dermatitis, irritation and erythema52. This natural plant product acts by inhibiting tyrosinase and decreasing melanin formation. The hydrolyzed product of arbutin acts as a free-radical scavenger and is more effective in inhibiting tyrosinase than arbutin. Its action is dose-dependent and has less severe adverse effects than HQ. Recently, a derivative of arbutin, namely deoxyarbutin, has been developed by removing hydroxyl groups. It produces reversible skin lightening by directly inhibiting tyrosinase53. Retinoids (retinoic acid, tretinoin, adapalene, tazarotene) have been used to treat melasma and PIH, either as monotherapy or combined with other agents including hydroquinone and topical steroids54. Used as monotherapy, 0.1% RA is more effective than 0.05% and 0.025%, but is also more irritating. With isotretinoin the response is equivocal but in Indian patients, adapalene is as efficacious as RA but with significantly less irritation. Though RA takes longer than HQ to act, the response when combined with HQ (5%), and lactic acid (7%) or ascorbic acid (10%) is not only more effective but faster as well. Irritation is the most common side-effect and may even cause hyperpigmentation; although, it is more frequent with higher concentrations of RA and less with adapalene. Photosensitivity is also common55. Ascorbic acid, also known as vitamin C, has been used in a variety of cosmetic preparations as an antioxidant, pH adjuster, anti-ageing and photoprotecting agent. Since it is unstable in aqueous solution, esters with similar properties are used. It can be used alone or in combination therapy. But this molecule is rapidly oxidized, highly unstable and does not work well alone; it is, therefore, usually combined with other agents such as liquorice extracts and soy to increase efficacy. It has a good safety profile56. It is an important component of many over-the-counter lightening creams. It reduces pigmentation by reversibly preventing transfer of melanosomes from melanocytes to the keratinocytes without affecting the tyrosinase activity57. Glycolic acid acts in hyperpigmentation probably due to its effect on epidermal remodelling and accelerated desquamation. Side-effects include irritation and erythema, which resolves upon withdrawal and moisturization58. Tranexamic acid (TXA) is a safe and promising drug for pigmentary conditions. It is a synthetic lysine amino acid derivative which mainly blocks the conversion of plasminogen to plasmin by inhibiting the plasminogen activator. This results in decreased free arachidonic acid production, and, hence, a reduction in the prostaglandin (PG) levels as well. Therefore, by reducing PG production, TXA reduces the melanocyte tyrosinase activity and plays an important role in the treatment of melasma, ultraviolet-induced hyperpigmentation, and post‑inflammatory hyperpigmentation59. NAG has been shown to decrease melanin synthesis and downregulate the expression of various pigmentation-related genes. Clinical studies have used either NAG alone or in combination with niacinamide. Overall, NAG has high tolerance, ease of formulation and stability in solution making it a suitable depigmenting agent60. Mequinol is a derivative of HQ. It acts as a competitive inhibitor reducing formation of melanin precursors. It is available as 2% solution containing 0.01% retinoic acid. Side-effects include irritation, halo-hypopigmentation, and depigmentation61. Liquorice is a root of the perennial herb. Glabridin and other oil-soluble derivatives of liquorice inhibit tyrosinase. Liquiritin, another derivative, reduces skin pigmentation, but without inhibiting tyrosinase. A 20% liquiritin cream was found effective at 4 weeks in treatment of melasma62. Soybean trypsin inhibitor reversibly inhibits the protease-activated receptor-2 pathway that is needed for melanosome transfer. Inhibition of this pathway caused a dose-dependent loss of pigmentation by as early as 4 weeks at the highest tested dose63. It is a prostaglandin E2 inhibitor and is known to have skin brightening properties64. Methimazole is an oral antithyroid drug which has been recently discovered to have a depigmenting effect if used topically in a 5% preparation65. It is similar to hydroquinone and is a tyrosinase inhibitor.It is an effective treatment option for topical hyperpigmentation management66. They are natural polyphenolic chemicals with anti-inflammatory, antiviral, antioxidant and anticancer properties. Catechins with gallic acid, ellagic acid and aloesin are a few such compounds. Ellagic acid is an antioxidant derived from certain plants like eucalyptus, green tea, and strawberry. It suppresses melanogenesis by blocking tyrosinase and does not cause any damage to the cells67. It is a new oligosynthetic peptide that inhibits tyrosine. Containing 0.01% oligopeptide cream, 20% glycolic acid lotion, an antioxidant cleanser and physical sunscreen, it is found to accelerate clearance in mild to moderate melasma. A study revealed improvement in facial melasma and clearance in just 6 weeks68. It is a structural analogue of vitamin A, which acts as an agonist to vitamin A, saturates melanocyte receptors, and reduces melanin production. It requires a prolonged duration of treatment but has few side-effects69. It is another monounsaturated dicarboxylic acid mainly derived by biofermentation of oleic acid. It interferes with melanin synthesis by binding agonistically to nuclear peroxisome receptors, which thereby regulate tyrosinase transcription and inhibit melanosome transfer. Study results using dioic acid 1% for 12 weeks have been positive70. They act against tyrosinase, TRP-1 and TRP-2 at the molecular level by interacting with translation of targeted mRNA69. Lignin peroxidase is a novel method of skin lightening and acts by targeting, enzymatically oxidizing and breaking down melanin in the skin. The application of lignin peroxidase cream provided a significantly more rapid and observable skin-lightening effect than 2% hydroquinone or placebo. Overall, lignin peroxidase is well tolerated with minimal to no side-effects71. Mulberry extract, thiotic acid, phenolic-thioether, cinnamic acid, pidobenzone, silymarin, 4-isopropyl-catechol and linoleic acid with lincomycin69. Topical agents act on different stages of melanogenesis; therefore, when combined, give better therapeutic results. Agents are also combined to reduce untoward effects, such as topical steroids reduce irritation due to both HQ and retinoids and retinoids themselves counter steroid-induced atrophy. Some agents are used as ‘stabilizers’ and hypomelanotic agents are often combined with sunscreens. HQ is the most commonly used agent, often being combined with glycolic acid, azelaic acid, kojic acid and retinoic acid, or corticosteroids. The most extensively studied and widely used combination with HQ is with RA and corticosteroids; this ‘triple combination’ is also called Kligman’s formula. Its original combination contained 5% HQ, 0.1% tretinoin, and 0.1% dexamethasone. Due to irritation, the combination has been modified to reduce HQ to 2−4% and tretinoin to 0.025−0.05% and the steroid has been variously changed to fluocinolone acetonide or others. It is extensively used as first-line therapy for melasma and other FM34. Chemical peels are generally effective in darker skin, especially superficial peels. Due to the increased risk of PIH, deep peels should be avoided. Pretreatment with a course of hydroquinone may improve results. Topical retinoids should be stopped before seven days. Standard options are glycolic acid 10–70%, salicylic acid 20–30%, trichloroacetic acid (TCA) 10–25%, and Jessner’s solution. Newer options include tretinoin, pyruvic acid, β-lipo hydroxy acid, mandelic acid, and amino fruit acids72. When selecting a peeling agent, the benefits of the procedure should always substantially outweigh any associated risks or complications. Superficial peels with appropriate titration of concentrations are generally safe and efficacious for darker skinned patients. Clinicians should be acutely aware that deeper peels carry substantial risks of inducing scarring and hypopigmentation in darker skinned racial-ethnic groups73. 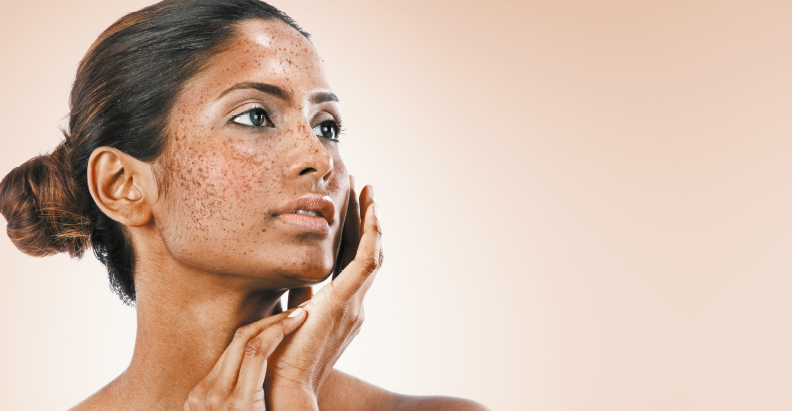 Laser therapy can be effective for hyperpigmentation with durable improvement. The treatment of hyperpigmentation with laser and light sources is based on multiple observations of the biology of pigmentation properties in the epidermis and dermis. First, melanin has a broad absorption spectrum. Second, melanosomes have a short thermal relaxation time, in the range of 50–500 ns. Lastly, longer wavelengths penetrate deeper and can target dermal pigment, but melanin absorption is better with shorter wavelengths74. Many reports have pointed out that the safest and most efficient laser for darker skin is the Q-switched Nd:YAG laser with its longer wavelength (1064 nm). A recent study has concluded that pulse-in-pulse IPL (PIP-IPL) might be a safe and promising treatment for melasma in darker skin. Fractional photothermolysis laser 1550 nm and fractional CO2 laser are also effective laser options75,76. A new class of lasers that generate picosecond-domain pulses. Shorter laser pulse durations result in pigment fragmentation that is more a result of photoacoustic than photothermal effects. Therefore, it may be more efficient at pigment removal without inducing thermal damage to the surrounding tissue. Picosecond lasers are currently available with laser outputs of 532 nm, 755 nm, and 1064 nm. However, their efficacy is still to be established77. Treatment with lasers for facial hyperpigmentation has been associated with an unpredictable response, frequent relapses and high risk of both post-inflammatory hyper- and hypopigmentation. Proper patient counselling in regards to side-effects and expectations along with test patch should always be employed prior to any laser procedure. Patients with resistant melasma, especially with a prominent dermal component, have been successfully treated with local or full-face dermabrasion to the upper or mid dermis using a 16-mm diameter coarse grit diamond fraise. Side effects may include hypertrophic scars or permanent hypopigmentation but are extremely rare78. Facial hyperpigmentation in skin of colour can be extremely distressing for a patient. 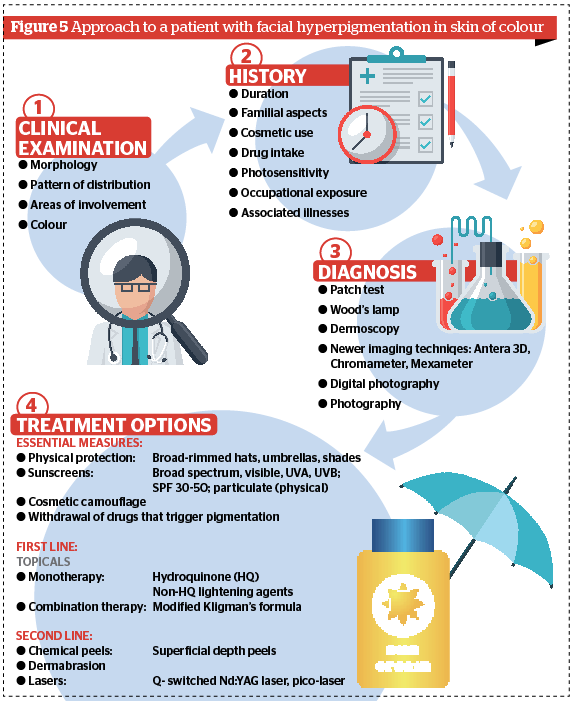 There is a significant impact on the patient’s quality of life; therefore, an accurate diagnosis, effective treatment, and patient counselling is imperative. The physician’s judicious choice of procedure with flexible treatment strategy is important, and emphasis on the need for a long-term maintenance therapy needs to be advised. Nakayama H. Pigmented Contact Dermatitis and Chemical Depigmentation. In: Rycroft R, Menne T, Frosch P, Lepoittevin J, eds. Textbook of Contact Dermatitis. 3rd ed. New York, NY: Springer; 2001. p. 319-33. Kanwar AJ, Dogra S, Handa S et al. A study of 124 Indian patients with lichen planus pigmentosus. Clin Exp Dermatol 2003; 28:481– 5. Sarkar R. Idiopathic cutaneous hyperchromia at the orbital region or periorbital hyperpigmentation. J Cutan Aesthet Surg 2012; 5:183– 4. Roh MR, Chung KY. Infraorbital dark circles: deﬁnition, causes, and treatment options. Dermatol Surg 2009; 35:1163–71. Pinnell SR, Fairhurst D, Gillies R, et al. 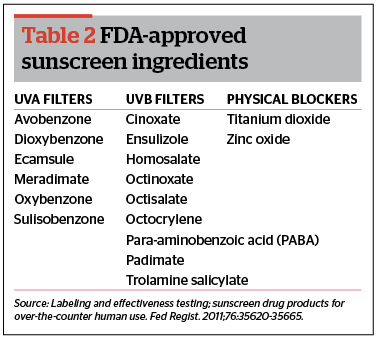 Microfine zinc oxide is a superior sunscreen ingredient to microfine titanium dioxide. Dermatol Surg 2000; 26(4):309-14. Kasraee B, Safaee Ardekani GH, Parhizgar A, Handjani F,Omrani GR, Samani M, et al. Safety of topical methimazolefor the treatment of melasma. Transdermal absorption, the effect on thyroid function and cutaneous adverse effects. Skin Pharmacol Physiol 2008;21:300-5. Wiechers JW, Rawlings AV, Garcia C, Chesné C, Balaguer P, Nicolas JC, et al. A new mechanism of action for skin whitening agents: Binding to the peroxisome proliferator-activated receptor. Int J Cosmet Sci 2005;27:123-32. Mauricio T, Karmon Y, Khaiat A. A randomized and placebo-controlled study to compare the skin-lightening efficacy and safety of lignin peroxidase cream vs. 2% hydroquinone cream. J Cosmet Dermatol 2011; 10:253–9. Khunger N; IADVL Task Force. Standard guidelines of care for chemical peels. Indian J Dermatol Venereol Leprol 2008;74Suppl:5-12. Sheth VM, Pandya AG. 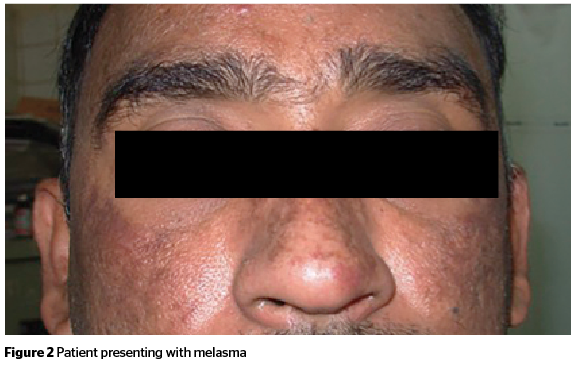 Melasma: a comprehensive update: part II.J Am Acad Dermatol 2011; 65:699–714; quiz 715. Cho SB, Kim JS, Kim MJ (2009) Melasma treatment in Korean women using a 1064-nm Q-switched Nd:YAG laser with low pulse energy. Clin Exp Dermatol 34: 847-850. Dermalmd skin lightening serum is amazing! After 5 years of stuggling with Hyperpigmentation and Melesma, & spending thousands of dollars trying to get rid of it, this is the only product that has actually worked!! !